Many of us like to participate in sports activities. From those who have an avid interest to those who just wish to keep fit; from the elite professional to the casual participant. Many of the injuries that occur when taking part in sports activities are the result of overuse i.e. playing too hard and too often e.g. tennis elbow, golfer’s elbow, and biceps tendinitis, or from not warming up properly beforehand or from not warming down after exercise. Young people especially are vulnerable in sport as their growing bodies are often expected to perform to high standards and they put exceptional physical demands on themselves. The good news is that although sports injuries are common, those who are fit tend to recover more quickly and easily from their injuries. An osteopath can help improve performance as well as treat the occurrence of injury. By using their knowledge of diagnosis and highly developed palpatory skills they can help to restore structural balance, improve joint mobility and reduce adhesions and soft tissue restrictions so that ease of movement is restored and performance enhanced. For those of you wishing to keep fit, the osteopath can help you keep supple and improve muscle tone so reducing the risk of injury to soft tissue unaccustomed to the extra work they are being asked to do. Advice on diet and exercise which will help you with your specific sport may also be offered. • Following a joint injury apply ice to the area for 10 minutes, every hour, if practical. Apply a bandage to compress the tissues. Elevate and rest if possible. 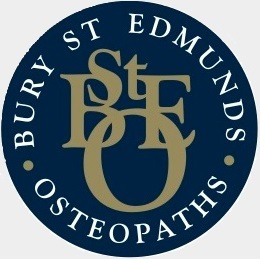 Here at Bury St Edmunds Osteopaths, we have a Sports Therapist to provide sports injury support. Contact us for more information.